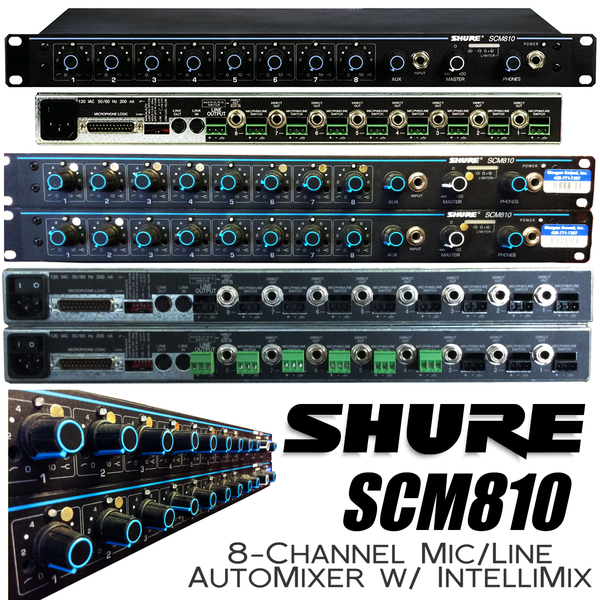 The SCM810 8-Channel Microphone Mixer features Shure's patented IntelliMix ® technology, which activates only microphones being addressed, minimizing poor audio caused by multiple open microphones. The rack mountable SCM810 is designed specifically for installed sound applications such as conference facilities, houses of worship, governmental institutions, schools, etc. Other features of the SCM810 mixer include adjustable EQ per channel, +48V phantom power, active balanced microphone - or line-level inputs, line-level outputs, highly RF-resistant chassis and circuitry, complete logic control of microphone activation, linking capacity for up to 400 microphones, with a 120/230V internal switching A/C power supply. Ships with IEC power cable.